Description: Explore a space station over run by zombies, buy and upgrade weapons and assemble a team of super soldiers to aid you in your battle. 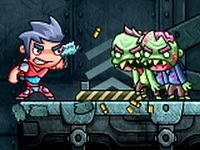 Fight off endless hordes of zombies in this rogue-like arena based shooter. How long will you last?